Donburi is a Japanese rice bowl dish which brings instant comfort to anyone craving for rice and stew. Being Asian, I have a soft spot for anything that involves rice. 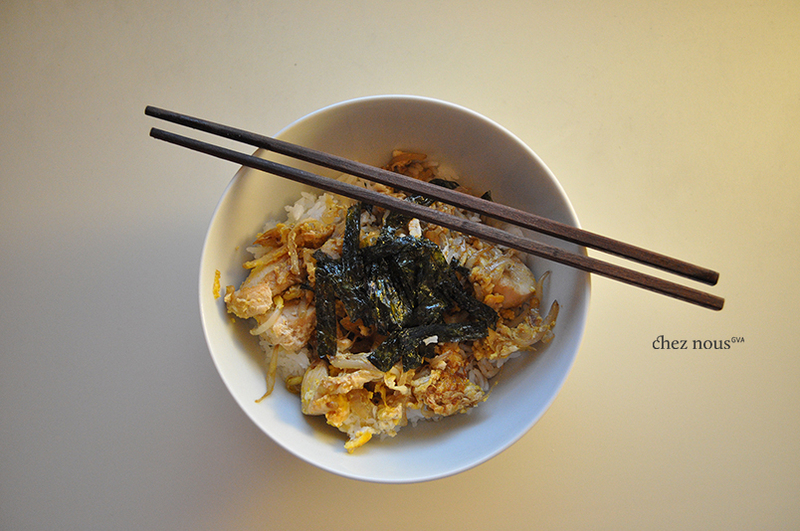 Sweet or savory, rice dishes tend to bring such nostalgia and a child-like pleasure to me. When I was studying in Basel, donburi was my go-to meal whenever I was feeling homesick, tired or just plain hungry-and-student-broke. It’s very easy to make, and the ingredients do not necessarily have to cost a fortune. You can actually make donburi paired with any meat or vegetable available in your fridge. You just have to make sure you have a stock of typical sauces that you can be creative with. Meet my first Oyako Donburi. 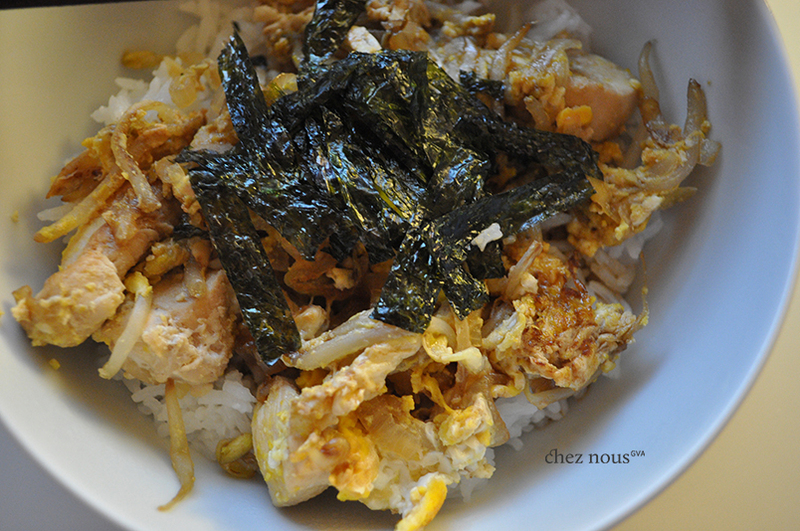 This basically consists of japanese rice, chicken, onions, and an egg. Cook your rice according to package directions and keep warm. Put ingredients together in a saucepan, heat and keep warm. Do not leave it simmering though as it will evaporate. Into a small frying pan over medium heat, tip just over a 1/4 of a cup of your broth. Add in 1/4 of the chicken, 1/4 of the onions, 1/4 of the mung bean sprouts and 1/4 of the spring onions and cook for 3 or so minutes until the chicken cooked through. Beat one egg in a small bowl and pour over chicken-onion-beansprouts mixture in the pan, swirl a little with a spatula and leave to cook until the egg is done. Place one serving of rice in a bowl and pour the cooked chicken and egg mixture over the rice. Add a spoon of the broth over the rice bowl and garnish with the roasted nori. Repeat these steps for the 3 remaining rice bowls.